I recently completed a couple of drawings for the Buxton Festival's 2012 brochure. This one is, obviously (well, at least I hope it's obvious), for a production of James and the Giant Peach. I do believe this is the first time I've actually made a drawing from a subject that is already so famous (I could be completely wrong, I have a rotten memory). I didn't really let that bother me, I just tried to, as every 'judge' of every tv 'talent' show says every five minutes, "make it my own". Yuk. It was obvious to me and I haven't seen that movie since my now grown son was little :). Great job! Eeek! You quoted one of my favorite songs by one of my favorite artists of all time! I love your blog even more. (sorry I just had to get that excitement out). your work is wonderful! Thanks for sharing! Oh wow! that's beautiful! the peaches skin is very peachy! Great illustration even though I don't know the story. It makes me curious about it. Oh Andrea! I can't believe how good this it. You should be illustrating children's books. Actually, that makes me think of something. I have an old friend from high school who's an amateur children's book writer. She hasn't tried to publish because she can't find any of her friends who could illustrate the book. She asked me but I just don't DO what you can do. I'm a realistic artist, I don't seem to allow myself to be as wonderfully whimsical as you. I don't know if you do stuff just for fun, it would have to be a collaboration... she couldn't pay you, but when I saw that wonderful peach and James I just wanted to throw it out there. Her stories are about sustainability and environmental responsibility (hey, she's an environmental lawyer, so I'm not surprised, lol). The one she wanted me to illustrate was about a fish who lost her jeans (genes). The local farmers had used them to enhance their fruit and she wanted them back... yes a little left of normal but probably fun to illustrate. I could tell her about you if you like. No pressure, if you just don't do stuff for fun, hoping later it would be published. no problem if you don't want to. Anyway, you should know that your "peach" is awesome. Seriously. wow, Andrea! It's perfect! I recognized it immediately; one of my favorite read alouds. Your drawing said it for you. 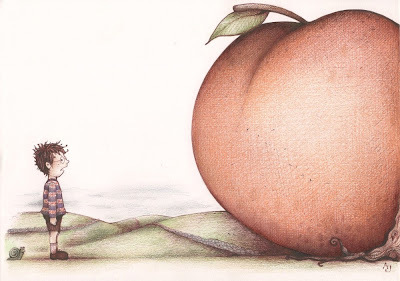 I have never read the book but thought "James and the Giant Peach" the second I saw it. So, mission accomplished. Very well, too. Like a bolt of lightning..the giant peach spoke of James to me---wonderful rendering---love all you do---makes one gasp! I like this and I got that it's James and the Giant Peach right away. brilliant. I love his clothes and the colours. gorgeous drawing! Yes, it is obvious. You are incredible.